A Derbyshire detective has been sacked and five other officers disciplined over the handling of events prior to the shooting dead of a showjumper. 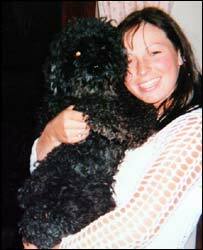 A police watchdog described inquiries prior to the killing of 26-year-old Tania Moore in 2004 as "abysmal". Former partner Mark Dyche, 37, shot her in the face after being jilted. Police failed to properly investigate Dyche's harassment of Miss Moore, it said. Her family said they held police responsible for failing to protect her. Dyche was jailed for life for her murder after a trial in 2005. Six officers admitted failing in their duties regarding a robbery investigation involving Ms Moore. A female detective was sacked, another officer demoted and four others - ranging from the rank of constable to chief inspector - were reprimanded by the Independent Police Complaints Commission (IPCC). All have 14 days to appeal. A seventh officer was cleared during the investigation, which also looked at how Derbyshire Police communicated with Staffordshire Police. The inquiry looked at how the police dealt with an earlier robbery involving Ms Moore, which was said to have been ordered by Dyche. During the robbery, which took place in June 2003 at her home, Ms Moore was attacked and had a mobile phone and watch stolen. During the murder trial, the court heard from the victim's friends that Dyche had repeatedly threatened to kill her, sent hundreds of threatening text messages and warned other men to stay away from her. Her family said in a statement that Miss Moore would be alive if the police had acted differently. Her brother Justin Moore said: "They let her and us down - which led to her murder by a psychopathic killer well known to police." Amerdeep Somal, IPCC commissioner for Derbyshire, said Ms Moore had suffered "a campaign of terror" after she ended her relationship with Dyche in February 2003. Ms Moore told police on "no fewer than six occasions" of problems that she was experiencing with Dyche. Ms Somal said: "The response by Derbyshire Police was abysmal. Collective failure by officers and their supervisors in Ashbourne Division meant no meaningful investigation took place." Basic lines of inquiry were never pursued - including taking key statements from Ms Moore and her family and investigating complaints against Dyche. Derbyshire Deputy Chief Constable Alan Goodwin said: "Throughout the investigation, our primary concern has been to ensure that Tania's family learn the truth about the way in which her requests for assistance were dealt with by the police officers with whom she came into contact. "I cannot imagine how traumatic Tania's death has been for her family and would like to express our deepest sympathy for their loss."